Disable autocomplete for your Gravity Forms with this copy-and-paste snippet. In my experience, autocomplete is generally more helpful than harmful but there are times when it just gets in the way. For those times, use this handy snippet by @ronalfy to disable this feature. 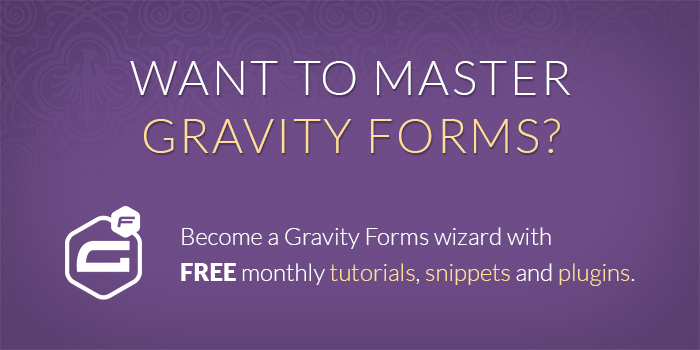 This snippet requires that HTML5 support is activated for your Gravity Form fields. To activate HTML5 fields, visit your settings page. This will work with even older versions Gravity Forms but that’s no excuse not to be running the latest version. Once you have installed the snippet, you’re good to go! This one’s plug and play. If you use it and like it, let us know! This snippet will apply to all forms and all fields. If you’d like to only apply this to specific forms and/or specific fields, let us know in the comments. Hi, How to disable autocomplete / autofill for a specific field? Hi Mart, same snippet but update the filter name to target your form and field: gform_field_content_FORMID_FIELDID. FYI, that Stack Overflow link/lead was provided in a different comment. Anyway, now it’s working for me the way I want. If there are any disadvantages to removing the HTML5 condition for the code, let me know, but so far so good. I’m pasting the code I’m using in the “Code” box, since it’s not allowed in the comment section. Hi Dave F, could you re-share your code via a snippi? Our “Code” box is no longer supported (now removed). This did not work for google chrome. Autofill was still working when I uploaded the script and tested it. Autofill is different than autocomplete and Chrome does not respect the autocomplete attribute for autofill. Try this it worked on some of my multi-page form but on the page where I had gravity-pdf preview it had no effect on the remaining address and email fields and in fact those reset the preview proving where this autofill was messing with earlier entries on other pages of the form. I still don’t know how to block it from happening it makes my extensive multi page form useless. Hello. How can I disable the autocomplete in a specific field? I badly need it. Hi, I am interested in using this code in my theme to disable Auto Complete in my Gravity Forms but the theme’s function file is limited and states not to enter any coding in it. Is there an alternative way please? Is there any other way of making this work please? Hey David, How can I use this feature for specific fields in a form? It is necessary in conjunction with Auto-complete perk so that the browser auto-fill does not interfere with that function (especially on mobile). Alternatively to automatically disable browser auto-fill for all fields where auto-complete perk is active. Hey Sam, drop me a line via support and I’ll update GP Auto-complete to automatically disable the HTML autocomplete. Is there a way to block a user from copying and pasting into a field? It does appear to be possible but I’m not aware of a Gravity-Forms-specific solution. Any way this could be modified for autocapitalize? And preferably to turn off autocapitalize AND autocomplete for a specific field (like email address, especially for mobile users)? Sure, Cieran. Duplicate the snippet and everywhere you see “autocomplete”, replace it with “autocapitalize”. Is there a way to disable autocomplete for a field type (like the date field) or for a specific field in a specific form? We don’t have a ready solution for this but thanks for the suggestion. We’ll see if other users need this too and update the article accordingly. I’ve had a look at your video where it shows your Perk – Auto Complete, http://www.screencast.com/t/RFsnB5xrg, however I have the perks packaged installed and I can’t find that perk anywhere. I can’t even find it through your site’s search. Hi Grant, try getting the snippet from the “raw” version. It looks like the formatted version above isn’t quite right. Thanks for replying David! Unfortunately I already did use the raw version, and it didn’t work for me. Any other thoughts on a fix? I didn’t realise GFs had autocomplete. Can you advise how to use this as I can see nothing about it? If you’d like to give this perk a try, pick up a copy of Gravity Perks and drop me a line via the support form requesting access to this unreleased perk. I didn’t even realize GF had autocomplete. I have never seen it in action. Is this on by default?